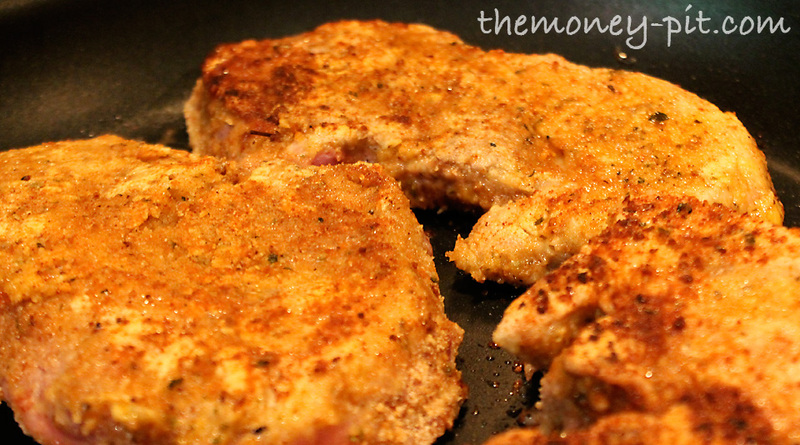 Since porkchops were on sale this week I decided to track down a new recipe I hadn't tried before and give it a try. I knew I wanted to bake them, but I didn't want dry tough pork. I decided to modify a recipe I found online. It came out GREAT! 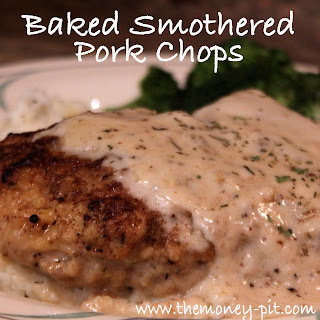 The pork was moist and the gravy was wonderful. 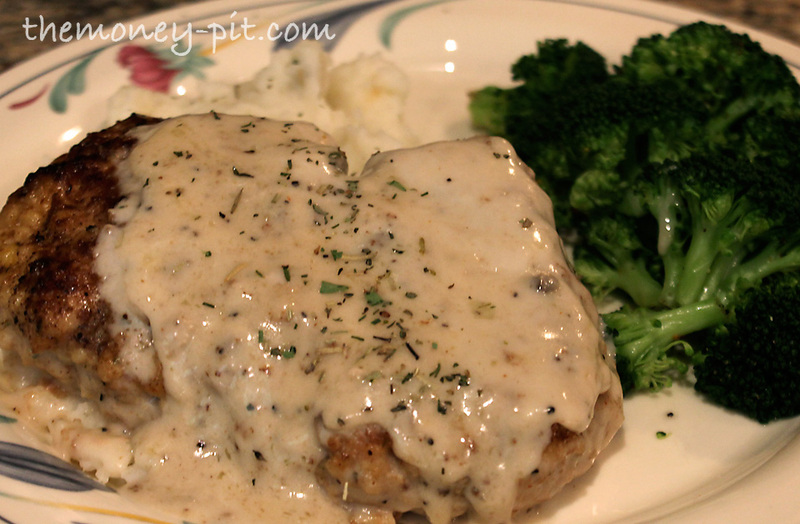 I served it over whipped potatoes and with a side of steamed broccoli. The kids loved it. Assemble your "coating" station. 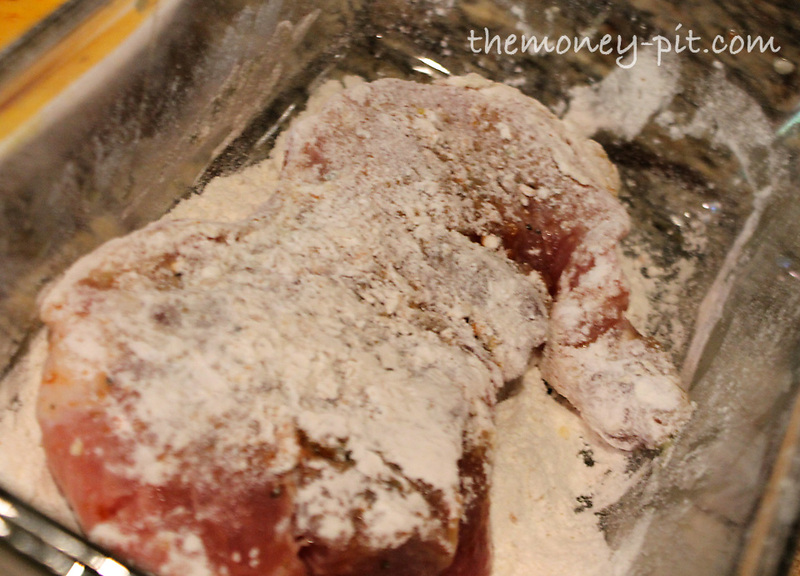 Place the beaten eggs, flour and breadcrumbs in shallow dishes. Rinse porkchops and pat dry. 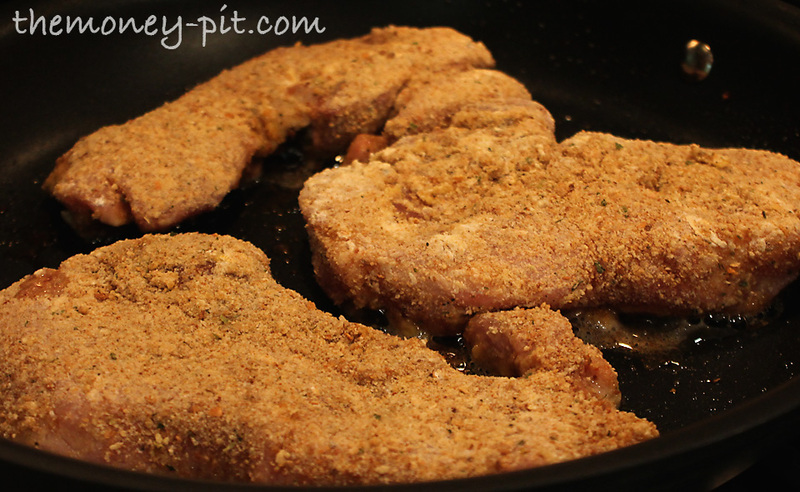 Fry the pork chops 5 minutes per side, or until the breading appears well browned (pork will not be cooked through). 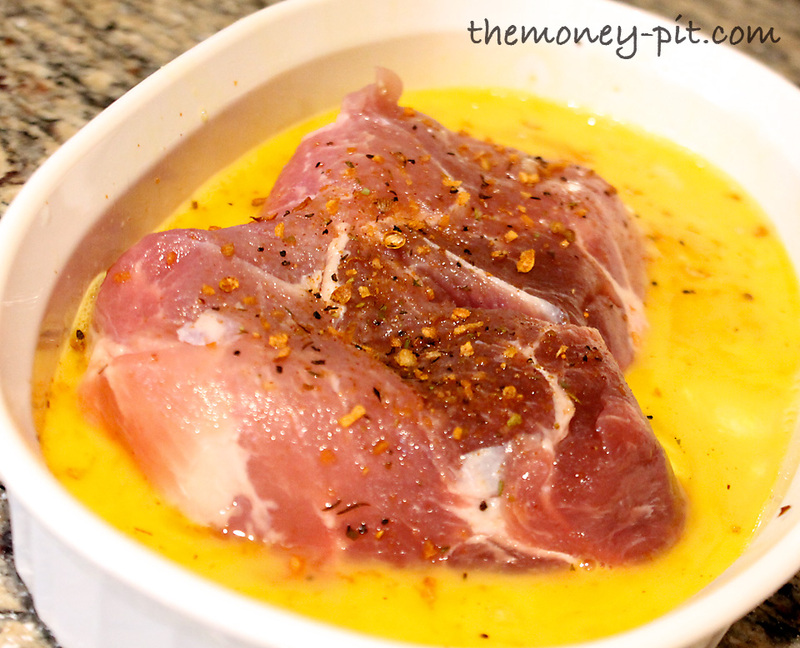 Transfer the chops to an oiled baking dish, and cover with foil. Bake for 1 hour. When they come out of the over there will be a lot of juices in the bottom of the pan. 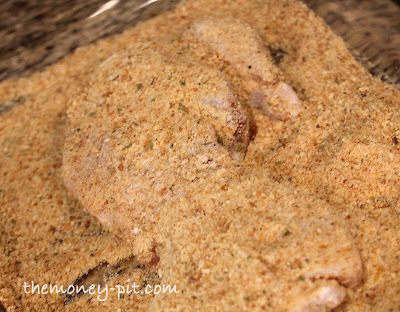 Pour over gravy mixture**, replace foil, and bake for another 30 minutes. 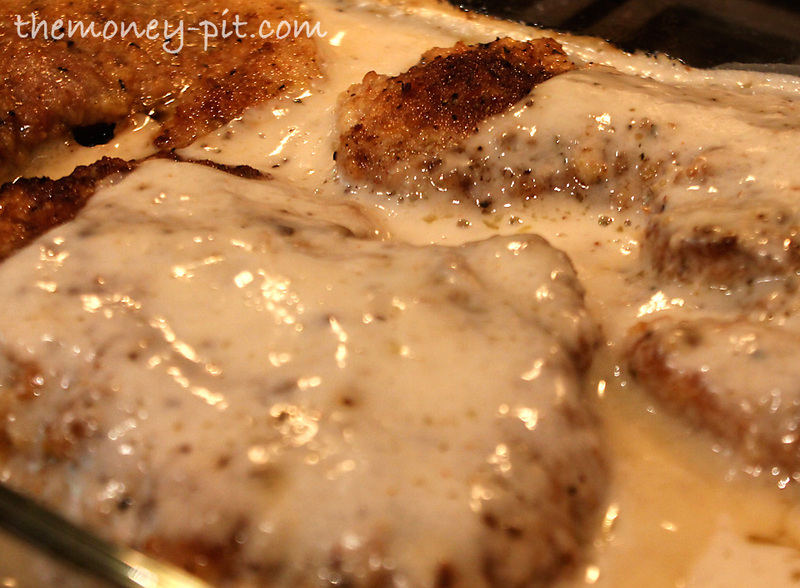 I served the chops over potatoes and spooned over the extra gravy. 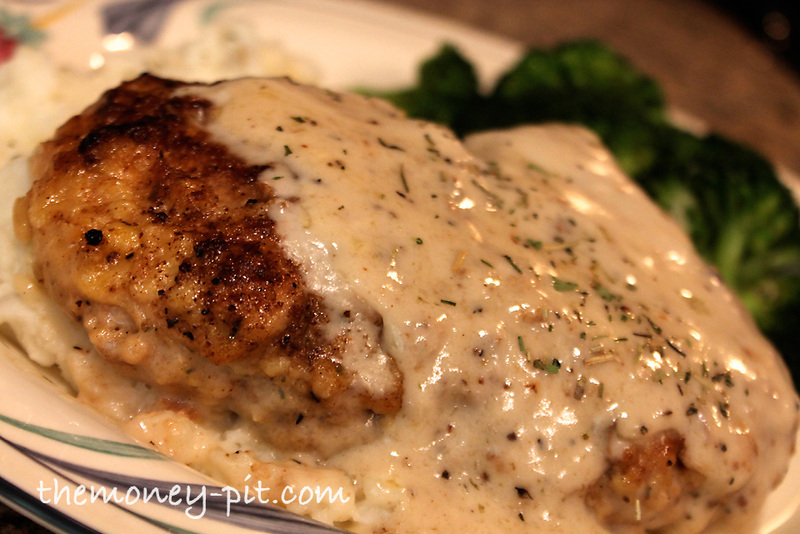 There is a lot of gravy for the number of porkchops, so it was nice to have a side dish which complimented it. **You may want to set aside some of the gravy and heat it separately to avoid the fat rendered out of the chops in the baking pan. 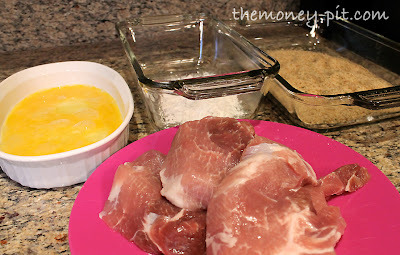 Linking up to CatchAsCatchCan, Debbiedoo's Newbie Party and here too! im not a fan of pork, but that does look tasty :o) I'm a fan of cream of mushroom soup turned in to gravy! Looks absolutely delicious; and I know so much better than to read a food blog at night (I'm starving now)!! !I'll be trying this soon! @Micki! Do it with chicken.. it would be good with this topping. Since it doesn't have much fat you would just have to be sure not to overbake it! This looks really good! Thanks for sharing - I "hopped" over from My Romantic Home blog hop. Oh you know I totally need to see a full on picture of the taters!!! YUM! Look at you with all those photos of your food. I'm impressed and giggling at home much things have changed since we first "met"! Looks good! 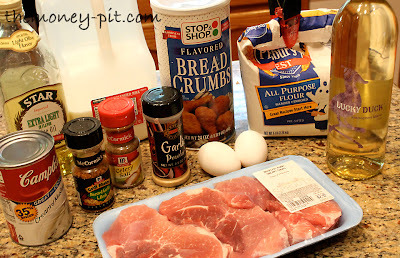 Thanks for sharing this with us this week at the Sunday Round Up Link Party. Thanks for sharing at SweetTalkin' Sunday!! Thanks for sharing at Sunday Round Up. This looks really really yummy! Oh yum! These looks so delicious! Thanks for sharing the recipe. Those look scrumptious! Thanks for sharing them and linking up! I'm new to your site but am so glad I came from MM. These look SO good and I am going to try these soon. Love your blog. Where have you been in my short blogging life? I am going to follow you! Hey there!! I just added myself to your followers for support, and wanted to invite you to check out an awesome Modcloth giveaway I'm having! Scratch that...I see it:) Thank you. 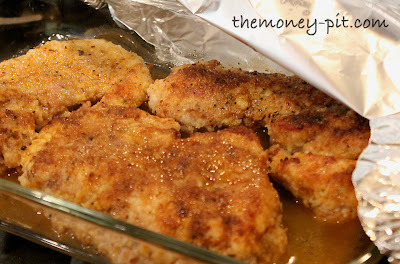 Just made these for dinner, it was delish. I cut potatoes in cubes to boil but instead just put them in the pan with the chops with a few onions. Pork was so tender and that almost never happens for me. Next time, I'm gonna double the gravy recipe. Looks like a fantastic recipe!!! Thanks for sharing at Creatively Living! i used your recipe and made these tonight! 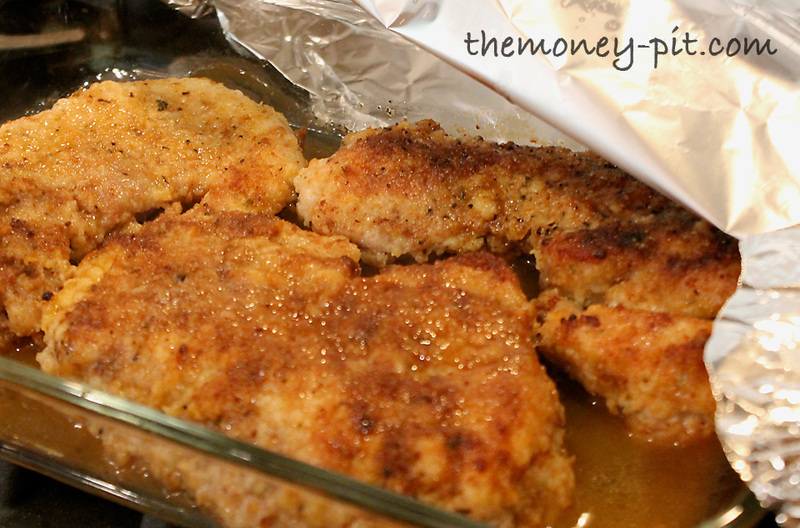 My family loved them....i had to tweak it a bit....like make my own breadcrumbs and used apple cider vinegar instead of white wine...but it was awesome. thanks! what temp should the oven be on? 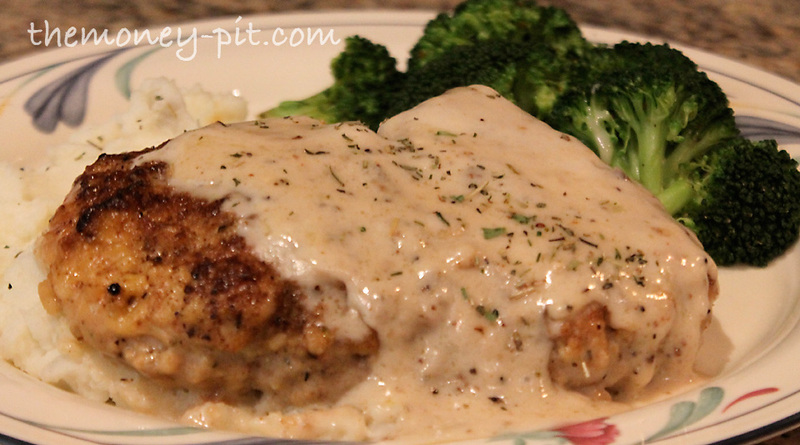 this was absolutely fabulous...the whole family loved it! the only changes i made were i used cream of chicken [because i dislike mushroom] i used mrs. dash garlic & herb for the seasoning, chicken broth instead of the wine and added sauteed onions in with the gravy...yum! These were the best! 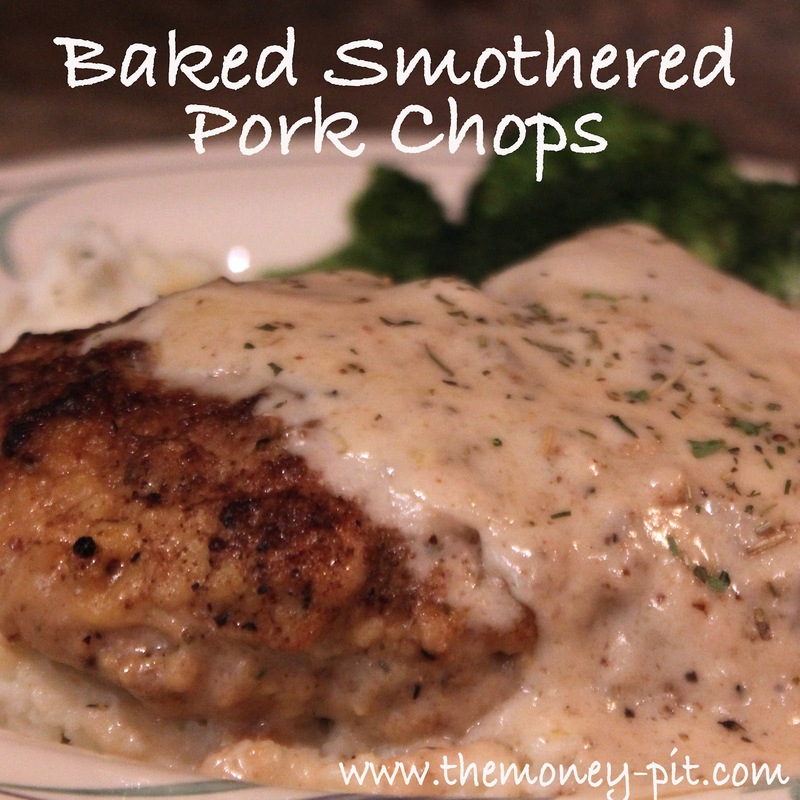 I've tried several similar recipes but this one nailed it!!! Thanks for fine tuning..
Wine does make it much better. I seem to never have it on hand. But did this time! This is amazing!!! My husband and son love it so much that they bragged to my father about it and now whenever I make it I have to make extras to bring to his house. Thank you so much!